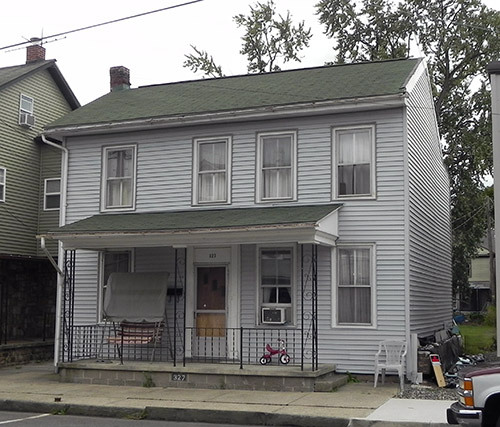 On 20th March 2013 we published a report about Linda Metzger, #327 Race St. and the severe damage done to her family home by demolition contractors working for Mayor Persing as he sought to expand his Softball Hall of Fame. 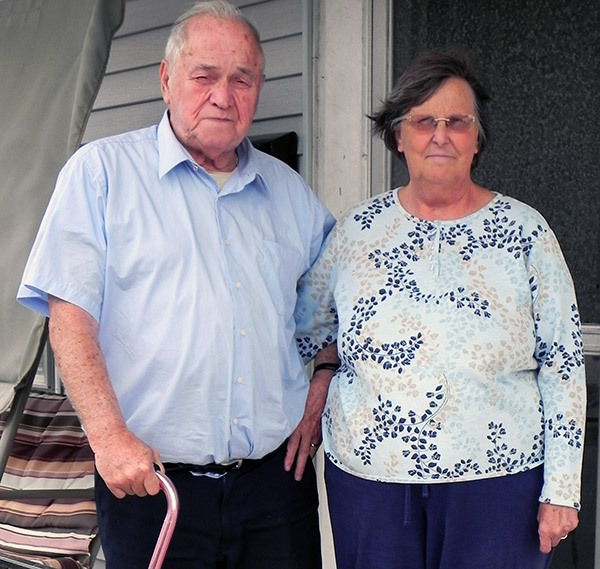 This week we returned to the scene for an update, and were horrified to find that this 67-year-old woman and her disabled husband are still fighting to keep out the rain and dampness from their home or to get any form of a settlement from Persing, who is denying liability, and has hired a team of ASA lawyers to act in his defense. Linda has retained the services of local attorneys Kymberley Best and Timothy Bowers to pursue a claim for damages against all those involved. Linda’s house shared a common dividing wall with the property being demolished, the former home of members of the Shipman family. Linda was a helpless bystander as contractor Steinbacher from Williamsport spent all of 3 hours closely examining this dividing wall, constantly moving from front to rear and back again. He exuded no air of confidence, and when the actual work began it proceeded very gingerly. He carefully pulled down the wall next to Linda’s house one section at a time. It got to the point where everything was down except for the front porch wall and roof. He was heard to tell his men that he would tackle this section himself and he hoped it would not make the dividing brick wall fall down. As he pulled the roof off, the whole wall moved with it and came tumbling down with a loud roar, exposing Linda’s internal walls, her wiring and everything else. You can see it all as it happened on the video below. Linda cried out for someone to help. “No” said Steinbacher, the Mayor’s contractor. “I did the job I was paid for”. “No” said Seiple’s, the Mayor’s architects. “The damage is on private property”. Mayor Persing looked at the damage, mouth agape, and appeared lost for words. He was not prepared to help either. It was a wet day, and yet everyone left the scene. Nothing was done to protect the property. No tarps were put in place. 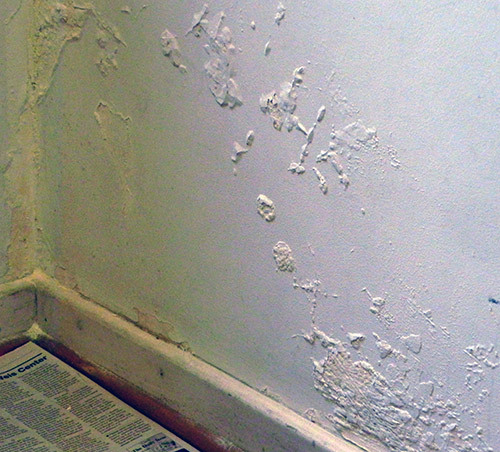 It was 48 hours before Linda could get this taken care of, and in the interim her walls were soaked right through. “No” said city clerk Terry Specht. “You were given a year to prepare for this”. Prepare for what? Linda might well have asked. For my house to be almost destroyed? How can anyone prepare for that? “Why didn’t you ask someone for help?” – city code officer Joe Swope. That is the whole point Joe, she did! Up until then, Persing would walk by Linda’s house every evening on his way to check on progress with his new building He has never walked that way again! Linda’s attorneys called in an engineer to check her property. He told Linda that her side wall did not have a foundation. Had it not been for the supports which her father had added to the basement years before, there is no telling what might have happened to her house. He said that the right hand wall will need to be supported by jacks while the old foundation is excavated, dirt removed, new footer poured and new supporting block wall built. Further repairs are required to the existing wall, including siding replacement and roof reinforcement. Linda and her husband will need to move out while the foundations are being put in place. Cost of work is estimated at $15,500 if there are no unseen issues. This is in addition to the $5000 or so from her personal savings that Linda has already been obliged to spend. 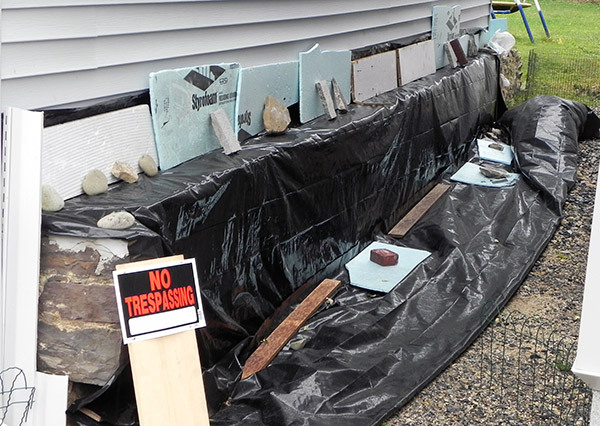 One day recently Linda came home to find someone had placed concrete blocks at the side of her house along with a “No Trespassing” sign. Fortunately she saw them before it got dark and moved them away. She was worried about the potential danger to her invalid husband or her grandchildren tripping over these blocks and injuring themselves. Next day a woman who, from Linda’s description could only have been Hall of Fame manager and Mayor’s wife Kathaleen Persing, put the blocks back. Linda challenged her. Mayor Persing had told her that she could have full use of the strip of land at the side of his building. No way, she was told, this could not be done. So now, after almost destroying Linda’s home and refusing to accept responsibility for their actions, the Persings are adding insult to injury by denying her the right to maintain and repair her property. We have been told that such action is illegal. Once again we see an out-of-control Mayor who believes the law only applies to others and not to himself. Insiders at City Hall have told us how Persing has been obsessed with this issue for weeks; in fact ever since he found out he might be sued. He sees the unfortunate Linda as some kind of enemy – a tiny pawn in the grander scheme of things who would never have presumed to challenge his right to rule Sunbury in any way he sees fit, unless she had been put up to it by those whom he terms “anti-Sunbury people”. In his mind Sunbury is his kingdom, a place where he alone can exercise the rule of law, and one where nobody is going to stand in his way. Prior to the demolition he tried to buy Linda’s house for a derisory sum and then, after she refused, the actions of his demolition contractors almost destroyed the property anyway. He has tried to bully and coerce others in the vicinity to sell up too, in his constant quest to further expand his business empire. IMPORTANT! – Are you registered to vote in November? If you are not, and want to have a say in the future of your city, please use our “Contact Us” form and supply your name and address. You will receive a simple form to fill out and return to the County Election Office in Race Street. Deadline for this is October 7th, so don’t delay! This website is a blog meant to be “available for everyone – current residents, ex residents, or others with a connection to or interest in our City.” In the “Hello Sunbury” link to the left it is explained that this blog is meant to give residents a platform to tell the real stories of this city. The point of this website and this article are to make residents of Sunbury aware of what is happening in their community. This family has had their house seriously damaged and no one else will give them the platform to tell their side of the story. The Daily Item prints the stories that make Mr. Persing look good: http://dailyitem.com/0100_news/x964881605/Softball-Hall-of-Fame-expands-with-400-000-addition-in-Sunbury but does not print the story that would support the individuals most in need of the help and publicity. Since when do we support big business and forget about the people and homes in our own community? Regardless of if they were given a year to prepare, did the contractor tell them HOW to prepare? Did he tell her what to expect if she did not “prepare” adequately enough. The basement supports were added by her father “years before” so maybe he knew the foundation needed repaired/replaced but that doesn’t mean she knew. I am just shocked by how blase people can be when it comes to these types of situations. How would you feel if this were your home or your parents/grandparents’ home? Why should this family be spending thousands of dollars of their own money to repair this? Even if Persing isn’t financially responsible to fix the damage, wouldn’t a Mayor who truly cares about his community be concerned by the situation his crew caused and urge his men to help fix the problem or find a way to help her? Since when do we allow our public officials walk all over the poor, sick, and elderly for profitable gain? THIS HAS TO STOP! This administration has been allowed in power for WAY too long and feels above the law because there is never any penalty to their actions. Why? Because they have been in their position of power for so long that everyone who is responsible for penalizing them is either their friend or has been bullied to believe they will lose their job if they speak out against them or hinder their plans. Want an example of this bullying? Go to any city council meeting and see how the council treats the audience or for a very clear example watch the 4/22/13 video of the city council meeting starting at 28:27 and ending at 38:00 (http://www.youtube.com/watch?v=QF-RHQEP4J4#t=1739). The appalling manner in which this administration treats citizens who bring up valid concerns and councilmen who are trying to address those concerns needs to stop. PLEASE PEOPLE! WAKE UP! YOU HAVE THE POWER TO CHANGE THIS! STOP ALLOWING BULLIES TO RUN OUR CITY!